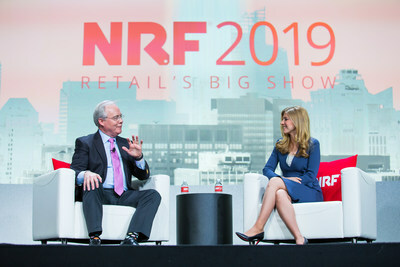 CINCINNATI, Jan. 15, 2019 /PRNewswire/ -- The Kroger Co. (NYSE: KR) Chairman and CEO Rodney McMullen provided his outlook on the future of retail at the NRF 2019: Retail's Big Show in New York City during a dynamic keynote presentation themed Restocking the future: Kroger's insatiable appetite to play and win the long game. CNBC "Squawk on the Street" and "Closing Bell" Anchor Sara Eisen moderated the 30-minute conversation on Sunday. Here are Mr. McMullen's five predictions for the future of retail. You can view the full-length keynote presentation here. The industry experiences disruption and transformation every few years, but it's happening at a more rapid speed than ever before. Leaders in the industry must be willing to not only accept and react to change, but also transform their growth model. Technology and digital are already mainstays of today's retail; however, in the future of retail, customers will not spend meaningful time thinking about physical vs. digital. Customers will always choose the shopping modality – whether physical or digital – that will deliver anything, anytime and anywhere. Retailers will create solutions on customers' terms. That is why Kroger is building an ecosystem that offers a variety of modalities, including brick and mortar, delivery, pick up and ship. Retail will solve problems not only for customers, but also for communities and the planet. Stakeholders are increasingly deciding which businesses to support based on shared values and clarity of purpose. Because of Kroger's Zero Hunger | Zero Waste commitments by 2025, the company decided to phase out use-once, throw-it-away plastic bags and transition to reusable bags in its stores on the same timeline. Advertisers spend $100 billion annually today, and retailers are uniquely positioned to know how customers behave and react to those marketing messages. That is why Kroger introduced Kroger Precision Marketing, powered by 84.51°. Kroger Precision Marketing provides consumer packaged goods (CPG) advertisers the ability to reach Kroger's more than 60 million customers through its ecosystem more precisely with measurable results. While on stage, Mr. McMullen also emphasized Kroger's Our Brands portfolio, which continues to perform exceptionally well with customers and is one of the most profitable parts of its supermarket business. Kroger recognizes there is an appetite for its Our Brands products like Simple Truth® in markets where the retailer doesn't have a physical footprint, illustrations include its relationships with Alibaba and Walgreens. Six years ago, Simple Truth didn't exist, and it's now the largest natural and organic brand in the country, topping more than $2 billion in sales annually. The retailer's latest Simple Truth television commercial is now airing in major U.S. media markets. Mr. McMullen also discussed how the company is at the forefront of shaping the national discussion around the disparity between food waste and hunger in America through Zero Hunger | Zero Waste, Kroger's ambitious social impact plan designed to end hunger in its communities and to eliminate waste across the entire company by 2025. He acknowledged achieving Zero Hunger | Zero Waste requires partnerships, creative ideas and scalable solutions to help change the food system. He announced Kroger has established a public charity to encourage this kind of innovative thinking. In February, the retailer will issue its inaugural open call and will award up $1 million to for-profit and non-profit innovators developing solutions for food waste prevention to test and scale solutions. NRF 2019: Retail's Big Show is a three-day retail event that attracts more than 35,000 attendees. Its 2019 focus is traditional retailers that need non-traditional solutions, online sellers that need a physical presence, and tech start-ups that need scale. With three full-day workshops and 50 exhibitor sessions, it's the largest retail conference in the world.